Nano silica sol (NSS) grouting is an effective method to improve water blocking capacity of rock fracture and fine sand. However, the mechanical and rheological properties of NSS grout remain poorly investigated. We study the properties by (1) measuring gelling time of NSS grout with a different accelerator dosage, (2) measuring shear strength of NSS with fall-cone test, (3) measuring the permeability coefficient of NSS, (4) measuring uniaxial compressive strength (UCS) of NSS mortar with different accelerator dosage and different curing conditions, and (5) conducting scanning electron microscopy (SEM) tests on NSS mortars at the sample age of 28 days. A new parameter R is introduced to represent the amount-of-substance concentration ratio of silicon dioxide (SiO2) and calcium chloride (CaCl2) in the mixture of NSS grout and the accelerator solution. 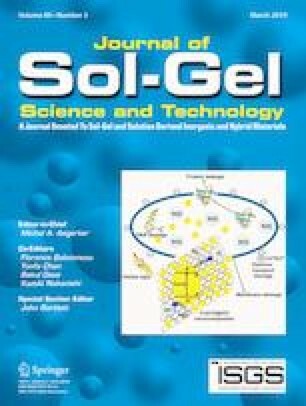 It is proven that the gelling time of NSS grout increases exponentially with the increase of R. The equation of real-time viscosity and permeability length is derived. The strength development of NSS and the stress–strain relationship of NSS mortar is observed. The corresponding relationship between the micromorphology and macro-mechanical properties of NSS mortar is revealed. Furthermore, the non-monotonicity of experimental data is discussed and a possible reason is given. The gelling time of NSS grout increases exponentially with the increase of accelerator dosage. The equation of fitted gelling time is derived through the gelling time test. The shear strength of NSS is measured through the fall-cone test. The permeability coefficient of the NSS is measured by the variable head permeability test. 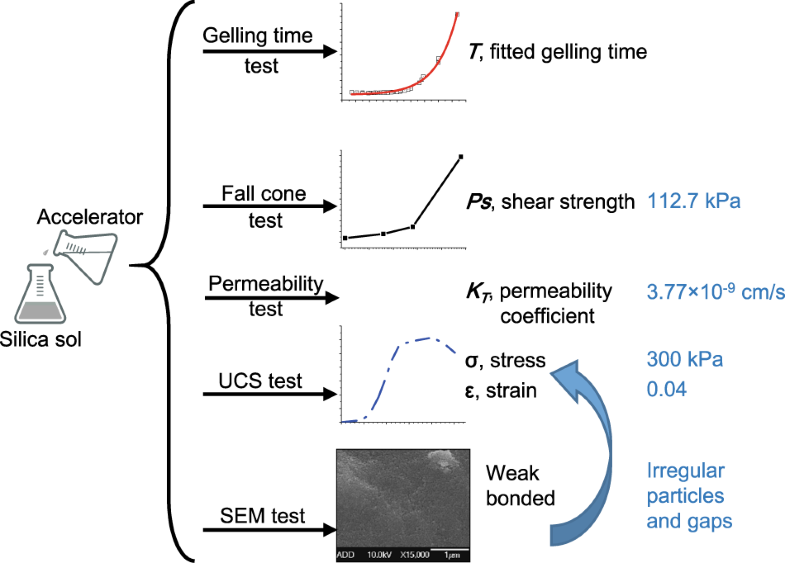 The stress-strain relationship of NSS mortar is revealed through the UCS test. The micro-morphology is observed through the SEM test. The weak bond of NSS explains why the stress is low and strain is large. The effect of NSS/accelerator volume and concentration is first unified. The equation of real-time viscosity and real-time permeability length is first derived. The micromorphology of NSS mortar at high magnification appears as irregular particles and gaps. This work was supported by National Key Research and Development Program (Grant number 2016YFC0600803), Natural Science Foundation of China (Grant numbers 51879150 and 51809115).